Blue Man Group bills itself as the “enemy of monotony, remedy for boredom, promoter of overjoy and elation.” While these sound hyperbolic, they are also quite true. The show, which touched down at the Orpheum Theatre on Friday night, is a refreshing piece of alternative theatre that blends wordless situational comedy and vaudeville with splashes of paint and percussion. Read the Twin Cities Arts Reader‘s interview with Blue Man Group cast member Steven Wendt. Blue Man Group thrives on the use of vibrant colors; many parts of the show are cued to different palettes. 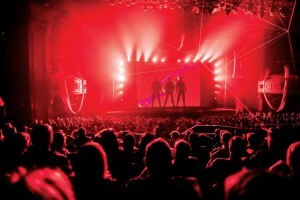 A large portion of Friday’s audience was composed of people who had seen the show before and dragged friends and family to see them. Most of the prepared content is identical to that seen when the show visited the Twin Cities last year; on a repeat visit, one realizes how much of the finely tuned presentation actually hinges on improvisation. This adds an extra element of excitement, especially when the audience realizes that the eponymous blue men on stage sometimes react to things that they say, do, etc. No great concentration is required, but the numerous sight gags and eyecatching effects will keep your eyes glued on the stage when you’re not overcome with laughter. This is a show that especially rewards purchasers of orchestra seats in front of the balcony; some of the more magical interactive elements simply don’t travel underneath the overhang. Most of the patrons at opening night didn’t seem to mind, although a few announced intentions of getting closer seats for the next time.